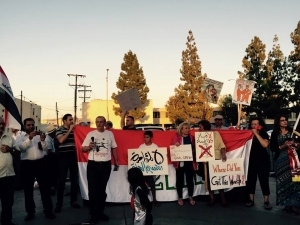 In El Cajon, demonstrators at the rally organized by the Iraqi Democratic Current chanted the same phrases as in Iraq, calling for a return to secularism and an end to corruption. “Where did you get the wealth?” a sign carried by one local woman read. 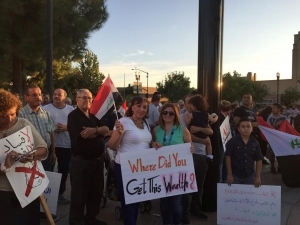 The protests in Iraq have made an impact. On Sunday, the Associated Press reported that Iraqi Prime Minister Haider al-Abadi cut 11 cabinet members—a third of his entire cabinet in response to the mass protests. His office says it will eliminate four ministries including human rights and women’s affairs, consolidating others. Those moves come after the Parliament last week eliminated the nation’s three vice presidencies and three deputy prime ministers. 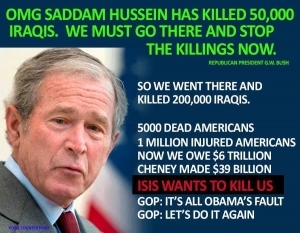 The structure was set up after the U.S.-led invasion of Iraq back in 2003 which ousted dictator Saddam Hussein and was meant to balance representation of Shiites, Sunnis and Kurds. Iraq’s Supreme Judicial Council has announced it will hold a special session Monday to review the proposed reforms, AP reports. The positions slashed by al-Abadi include former Prime Minister NuriKamal al- Maliki, who is implicated in a report by the Parlimentary Committee for Security and Defense. The report blames Maliki and other officials for the fall of Mosul to the Islamic State, or ISIL, CNN reports. Al-Abadi also announced approval of military tribunals for officers accused of abandoning their posts and weapons, allowing Ramadi to fall to ISIL.